Virtually nothing about this conflict was changed with Israel’s military operation in Gaza. Nothing on the surface, nothing lurking in the shadows, nothing for the history books. Yet the fundamentals of this conflict that have existed since 1967 are somehow becoming more obvious and less accessible every day. As rhetoric bleeds into strategy, sobering arguments are polluted by perverse distortions and the only thing that makes sense is confusion. As a humble remedy, perhaps, the following conversation is a synthesis of hundreds of hours of candid discussions (and screaming matches) between Israeli and Palestinian colleagues and friends. It offers no solutions or common ground, but only pain. Until we get through the meat of this war, the bones will never heal. Here is how these enemies think and argue. Ahmed: Why do you humiliate us every day, with your checkpoints, your raids, and your occupation? Why won’t you leave us alone? Avi: Because we believe that you would continue terrorizing us even if we give up the West Bank. If you were eager to kill Israelis long before any of us ever lived in the West Bank or East Jerusalem, how could we possibly believe that you would be satisfied by anything short of our expulsion from the region? You can talk about peace accords, but at the end of the day, which occupation do you want to end? The one in that started in 1967, or the one you say began in 1948 when the State of Israel was established? Ahmed: Well, I’ll answer that question with another one: You always talk about how important it is for Palestinians to recognize Israel, but which Israel do you want us to recognize? 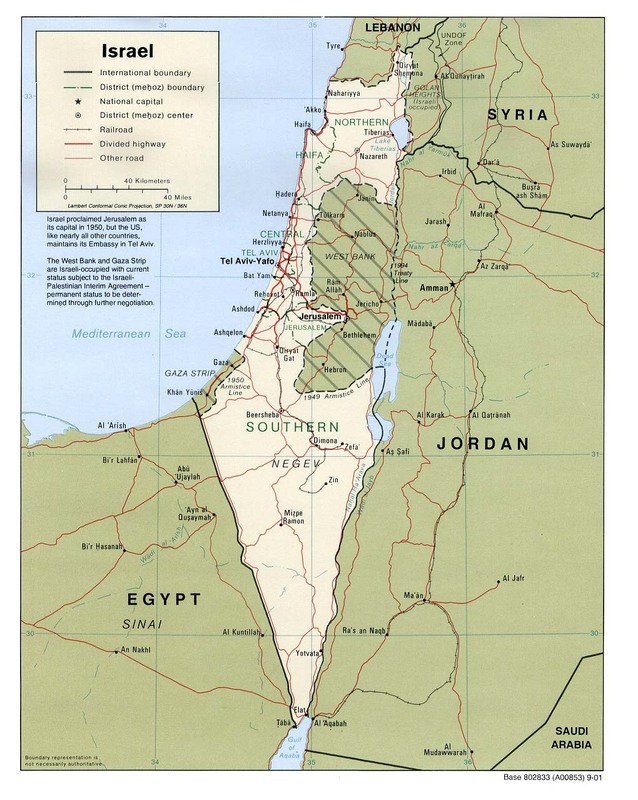 The Israel with pre-1967 borders? Or an Israel that occupies the West Bank and controls our movement with nearly 500 checkpoints on any given day? Or maybe an Israel that has been “converged” behind the “security barrier” wall/fence, which would almost guarantee a permanent separation between a Palestinian homeland and our most sacred religious sites? But to answer your question honestly, yes, your suspicions are correct: it is the 1948 occupation that we want to end, just like the Jews would love to have the West Bank as well. But we know Israel is here to stay, and we can tolerate you as much as you can tolerate us. But what we cannot tolerate is your occupation of East Jerusalem and the West Bank. Avi: Look, we don’t enjoy occupying the West Bank any more than you enjoy being occupied; it puts our soldiers at risk, it’s a drain on our military and it hurts our image abroad. We continue the occupation because we want to be safe from terrorism. Ahmed: But you are creating more resentment and terrorism with the occupation. Avi: That’s definitely true, but we know that if we withdraw from the West Bank, the terrorism will not stop and is likely to get worse. After disengaging from Gaza nearly 4 years ago, the only thing we got in return was strengthened resistance in Gaza. And now, because of the continuous barrage of Qassam rockets, we are evacuating our homes inside of Israel itself, not just in the territories. Gaza was your test. You proved that when given the chance to function peacefully on your own, you failed miserably. Ahmed: Of course we failed in Gaza. You still control our airspace, our coastline, our borders and our economy. You pretended to take the moral high road with your “test,” but you did it for strategic reasons and with no follow-through. And it has nothing to do with Hamas. Our economy was already dead before you made Gaza a giant outdoor prison. For years you have made Palestinians dependent on the Israeli economy so you could control us as much as possible. Even before Hamas took over Gaza, farmers were stuck at border crossings for days, watching their vegetables rot while your soldiers closed border crossings at random just to frustrate us. Avi: So you take no responsibility for your inability to promote peace in Gaza? And what difference does it make if we evacuated Gaza for strategic reasons? You should want to prove to the world that you can function peacefully. Granted, we set the terms for the pullout, and you can only do so much with severe sanctions and closed borders, but we gave you Gaza—we gave you something—and you failed to take advantage of it. Ahmed: You did not “give” us anything. You returned it. Avi: Fine, we returned it. It was a public relations coup for us. We should have negotiated Gaza back to you, but we didn’t; we evacuated it, and we ruined the credibility of the moderate Palestinians. But it was still something. Why aren’t you openly furious with the Gazans who confirmed everyone’s suspicions when their first response to our evacuation was a whole-sale pillaging of every building in sight and an increase in rocket/mortar attacks against southern Israel? Don’t you want to persuade us (and the rest of the world) that you are not just another group of thugs and terrorists? Ahmed: Why should we? Palestinians have gotten almost nothing from negotiating with Israelis, and we cannot imagine why it is we who have to prove anything to anyone. The real question is: How can you persuade us that you are serious about peace when you took those uprooted settlers from Gaza and gave them new homes in the West Bank? Is that what you call a “confidence-building measure”? No, of course not—your unilateral evacuation was a public relations stunt. Gaza is not strategically important to Israel, and Sharon knew that abandoning it could ensure an even tighter grasp of the West Bank, which is really what you wanted all along. Avi: Look, I think it was a terrible decision to transfer any of the Gaza settlers to the West Bank, and I think the settlers should not be in the West Bank or Gaza at all. But occupying the West Bank militarily is strategically important because it protects Israel’s dense population centers. Heavily occupying East Jerusalem (and a few other parts of the West Bank) provides a crucial buffer zone protecting our vulnerable spots from terrorists. So even if we stopped being hypocritical in every way you claim we are, then, as the more powerful party, we still have to be convinced that a free and shared Jerusalem will actually be a city of peace, and that the fighting will stop. If we had any sense that you would actually stop resisting once we ended the occupation of the West Bank or even East Jerusalem, most Israelis would gladly hand it over everything except the Old City. Ahmed: The fanatical Jews in Hebron would never consent to that. Avi: Of course not, nor would Islamic Jihad ever disarm for any negotiated settlement. The difference between us, though, is that the Israeli government has the power to force a negotiated settlement upon Israelis. We hated uprooting Gaza’s 8000 Jewish settlers; they spit on our own soldiers and called them Nazis. But it had to be done, unilaterally or otherwise. But can Palestinian leaders and institutions exert the same legitimate, authoritative control over its own people, including the radicals? Ahmed: If most Israelis would hand over Hebron if they thought doing so would make them safer in Israel proper, then the same is true of Palestinian resistance: in the late 1990s, Fatah cracked down on Hamas so much that only 8 Israelis were killed by Palestinians between the summers of 1997 and 2000, compared to more than a thousand during the 2nd Intifada. We were promised at Oslo that if we delivered security, you would reverse settlement growth (or at least freeze it! ); but the “dovish” Ehud Barak oversaw the development of more settlements than any other Israeli prime minister. You had your deal; you were getting virtually everything you asked for, and in return, all we got back was Jericho. You got greedy and thought you could enjoy your settlements and your peace. We controlled our radicals then, and you’re still complaining that you don’t have a “credible partner for peace.” And now that may be true, but only because you humiliated those of us who had faith that you would deliver. Now everyone thinks you suckered us, including me. Avi: Okay, you’re right on this one. We wanted to have it both ways, and it cost us both a lot. But now the 2nd Intifada has compelled us to start building trust again, and we have created so many new terrorists that we are now faced again with the same problem: even in the best case scenario, it’s not the vast majority of Palestinians that we worry about. We are worried about the one percent that will simply never give up killing Israelis until we move to Alaska or Uganda or wherever. And among a population of 3.5 million, one percent is still 35,000—all of whom could exploit a peace settlement by launching rockets and mortars from ideal strategic positions on top of the hills surrounding East Jerusalem. Currently, we have the authoritative legitimacy to neutralize our own rabid one percent, but do you? Believing you is an incredible gamble for us. As terrifying as Gaza’s Qassam rockets are to Israeli residents of Sderot, Israel’s low-density population in the Negev make those rockets far less worrisome. But within the fantasy of a negotiated settlement, imagine how easy it would be for Hamas to launch these same Qassams from the hills of Abu Dis, just east of the Jerusalem’s municipal boundaries. Terrorists could kill hundreds or maybe thousands of Israelis in a single afternoon. And when they do, no matter how we respond—air strikes, invasions, doing nothing—not only would our options be severely limited by international scorn, but any and every one of those options would make our population significantly more vulnerable as a result. So even if we believed you were sincere, we have excellent reason to believe that you would lack the capacity to eliminate the militants operating on the ideological fringes of Palestinian society. Ahmed: You don’t get it. We’ve already proven that to you, and you blew it. Whenever Palestinians feel hopeful about the peace process, the government has more than enough legitimacy to confront our extremists. And your talk of security concerns is a joke compared to ours; you’re worried about losing hundreds of Israelis in a day, and we lost more than 200 Palestinians in as many seconds at the beginning of your latest escapade in Gaza. And then you have the nerve to tell us that we shouldn’t be allowed to have a military even after a negotiated settlement. Avi: If you want to talk about ethics, that’s fine. You are suffering far more than we are, and I wish I could make it stop. And even if you think Israelis are sadistic land-grabbers, at the end of the day we still have genuine security concerns that have nothing to do with cruelty, imperialism, or Zionism, and these concerns have to be addressed. Too often these legitimate security concerns are hijacked by Israeli fanatics who would feel lost if they had no one to hate. And we don’t do enough to distance ourselves from them, much as we feel you don’t do enough to distance yourselves from Palestinian extremists. Ahmed: But if most Israelis are not sadistic land-grabbers, then how can you explain the settlement growth in the West Bank—a blatant violation of international law and everyone’s common sense? Why not merely occupy the West Bank with soldiers for security reasons like any victor of war? And why are there 500 checkpoints in the West Bank when everyone knows that at least half of them have no strategic significance? Avi: The Israeli government has always supported the isolated settlements in the West Bank in order to have more bargaining chips if we start negotiating again. The same goes for the excessive checkpoints. But the settlements between the security fence and the 1967 border are very relevant to the security of Jerusalem, to the dense populations just west of the 1967 border, and to Ben Gurion airport. Again, these security concerns are not legitimate justifications for permanent occupation and settlement growth, but they are unquestionably the most accurate explanations—regardless of what any militant Jews on the fringes of our society will tell you. Ahmed: Even if our failure to govern would make you more vulnerable, then why not put your faith in the UN or the EU to monitor and enforce whatever negotiated settlement we conceive? You would be protected by legitimate international forces present in the West Bank. Avi: We did that in Lebanon last summer, and right now the UN is literally watching as Hezbollah re-stocks its arsenal, helpless to do anything about it. The UN even criticizes us for our reconnaissance flights over southern Lebanon to monitor what the UN fails to monitor and prevent. UN forces abandoned us in the Sinai before the 1967 war, nearly clearing a path for the Egyptian army. Likewise, until Hamas took over Gaza, the EU was “monitoring” the Rafah Crossing between Egypt and Gaza, and they were not even required to prevent known terrorists from entering Gaza; besides, the swiss-cheese Philadelphi crossing between Gaza and the Sinai reduced the EU operation the status of a charade, and rockets rained down on us all the same. That’s why we launched Cast Lead a few months ago. Nothing else worked. But Cast Lead didn’t help much either. Regardless, Jews have been burned by the international community so many times that it is nothing short of amusing when people still urge us to rely on them. Even still, we all know that, in the end, we Israelis will have to depend on others if we ever hope to find peace. We make plenty of mistakes, and at the end of the day, even when we are extremely professional and courteous occupiers, we are still occupiers. Our frustration with Palestinians is only matched by our desire to correct our mistakes. But the risk of doing so is undeniable. Ahmed: Undeniable but not insurmountable. How long can you continue justifying future mistakes by citing ones you’ve made in the past? How do you ever hope to control of your future if you are forever bound by the mistakes of your predecessors? And what good is recognizing your mistakes if you refuse to break free from their legacies? Damage control is not a policy; it’s a reaction. It is time to start acting. It is time for a paradigm shift in Israel. Avi: Sure thing. You first. Great piece. Would make a good primer for anyone looking to unravel the complex relationship between Israeli and Palestinian.